#LBBLoves: These Eco-Friendly Journals & Postcards Will Grow Into Plants! A beautiful initiative weaved in the pages of journals and postcards, Gift Green will let you grow what you sow. Imagine holding a journal, filling up the most beautiful memories and in stead of discarding it, you sow it so a lovely plant grows instead. Gift Green is a brand started by Mansi Shah who believes in sustainable environment and organic products. Therefore, her ecological sense comes from a green way of life and that spills onto her brand as well. There’s something for everyone, from journals, postcards, limited editions of coasters to even precious bookmarks. Imagine getting a journal, or a post card that you can plant in the pot. The sheets of these diaries come in different colours and infused with seeds that will grow into a plant. For example, the red sheet for tomatoes, green for basil and more. Just plant them in a pot, and a shiny happy sapling awaits you. These are also the plants that are easy to grown in tiny spaces, or even garden terraces, especially in a crammed city like Mumbai. 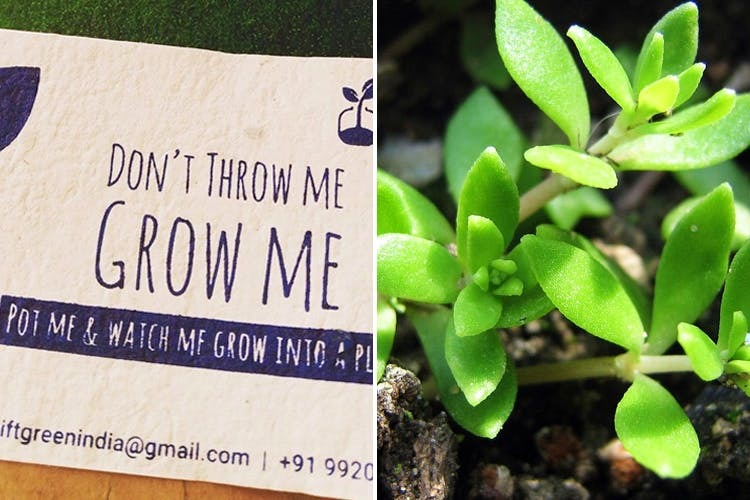 If you still aren’t convinced, well the postcards scream, “don’t throw me, grow me”. This comes in as a fresh wave of eco-conscious people considering India reportedly generates more than 15,00 tonnes of plastic waste everyday, out of which at least 6,000 tonnes remains uncollected and littered. Do we need more ways to bring about awareness? Gift Green is your start. We’re loving the eco-friendly products that we can easily nurture on a long-term basis. They also have eco-friendly modaks made from fresh earthy soil. These are perfect for the green souls out there, especially during the Ganesh Chaturthi festivities. A beautiful brand that incorporates the best of both worlds, environment and our love for the stationary. We can’t wait to get our hands on these, and get a potted plant started out at the balcony. To buy these beautiful postcards, and journals go here.